Brooklyn, N.Y., May 15, 2013 – MakerBot® made with “Brooklyn pride,” is proud to be one of the selected New York City-based designers to be highlighted at the MoMA Design Store Destination: NYC – Made in the USA, that launches May 15, 2013, at the MoMA Design Stores in New York. As part of the MoMA Design Store Destination: NYC – Made in the USA, MakerBot will showcase its MakerBot® Replicator® 2 Desktop 3D Printer (retailing for $2,199), as well as unique and iconic NYC-themed 3D printed novelty items ($7 each), such as the New York Public Library Lions “Patience and Fortitude;” the Statue of Liberty; the Empire State Building; the Chrysler Building Skyline; the Empire State Building Skyline; the Guggenheim Skyline; the Statue of Liberty Skyline; a New York City Subway Car; a New York City Taxi Cab; and iconic New York City street scenes of a subway entrance, a hot dog cart, and a Central Park Bench. There will even be a retro-inspired MakerBot-made MoMA-branded “Mix Tape” MP3 player ($45) and a cool MakerBot-made MoMA 3D printed watch ($68). Destination: NYC – Made in the USA is MoMA Design Store’s 11th event in the Destination: Design series. The collection features approximately 200 lifestyle products by 75 New York designers including home accessories, furniture, paper goods, 3D printed items, and jewelry. All products are designed in one of the five boroughs of New York City and manufactured in the United States. Muted colors, graffiti art and pop culture iconography are a few elements of New York’s culture that will be celebrated in the product collection. “MakerBot is very proud to have been invited to participate in the MoMA Design Store Destination: NYC – Made in USA program,” noted Bre Pettis, CEO of MakerBot. “MakerBots are made with Brooklyn pride and this is a great venue to showcase how 3D printing is helping fuel the Next Industrial Revolution – right here in New York. And the 3D printed MakerBot-made iconic New York scenes are something special to take home.” Pettis noted that MakerBot is helping fuel the Next Industrial Revolution by offering desktop 3D printers that are used for rapid prototyping and personal manufacturing by engineers, architects, industrial designers, artists, educators, and people that just like to make things. MakerBot’s 3D Ecosystem makes the design and 3D printing process even easier by offering tools and services that bring the design and 3D printing process closer together, such as MakerBot’s website Thingiverse.com, that has more than 80,000 3D designs available for sharing and printing. Thingiverse.com has had more than 17 million downloads of items from its site. MakerBot’s 3D Ecosystem is also made up of its MakerBot Replicator 2 Desktop 3D Printer, the MakerBot Store, MakerWare, MakerCare, the MakerBot 3D Photo Booth, Bre Pettis’ book “Getting Started with MakerBot,” classes and workshops on 3D printing, the soon-to-be-released MakerBot Digitizer Desktop 3D Scanner, and strategic partnerships with like-minded companies, such as Autodesk and its 123D family of design products, OUYA, Nokia, Printcraft, MoMA, and many others. “We are so impressed by the depth of local talent submitted during our Open Call for New York designers last year,” says Emmanuel Plat, Director of Merchandising of MoMA’s retail division. “The innovative products and unique designs truly reflect urban living and led us to create our largest collection to date.” The Destination: NYC product collection will be available in MoMA Design Stores in New York City (11 West 53 Street, 44 West 53 Street, 81 Spring Street) and Tokyo and at MoMAstore.org, MoMAonlinestore.co.kr, and MoMAstore.jp beginning in May 2013 and running through August 2013. Destination: NYC is made possible by the generous support of the International Contemporary Furniture Fair® (ICFF®). MakerBot will also showcase the capabilities of its 3D desktop printers in the MoMA Design Store, and the MoMA Design Store will be an authorized retail outlet where MakerBot Replicator 2 Desktop 3D Printers can be purchased on-site. The two locations offering MakerBot Replicator 2 Desktop 3D Printers will be at the New York City MoMA Design Store locations at 81 Spring Street and 44 West 53rd Street. 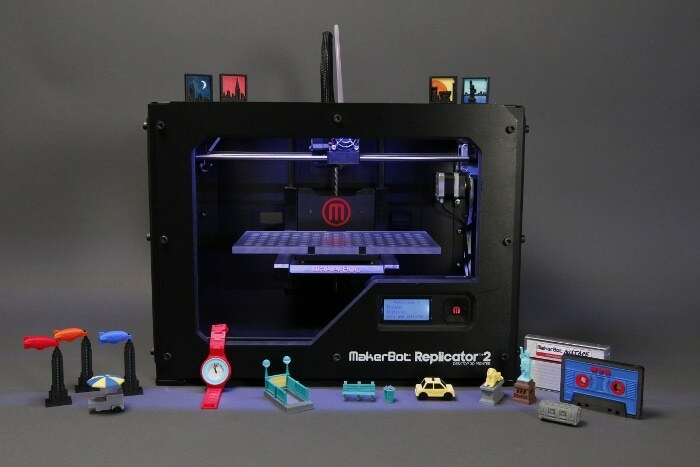 About MakerBot Founded in 2009, Brooklyn-based MakerBot has grown to be a global leader in desktop 3D printing. There are more than 15,000 MakerBot Desktop 3D Printers in use by engineers, designers, researchers, and people who just like to make things. The MakerBot Replicator Desktop 3D Printer has been named Popular Mechanics “Overall Winner” for best 3D printer and has numerous awards, including being honored as one of Time Magazine’s Best Inventions of 2012; “Best Emerging Tech” at the 2012 Consumer Electronics Show; won Popular Mechanics Editor’s Choice Award; the Popular Science Product of the Year; and recently was awarded a TechCrunch Crunchies Award for best hardware start-up; a Gold Edison Award for Best Design; and a Fast Company 2012 Innovation by Design Award, as well as being named by Fast Company as “One of the World’s Top 10 Most Innovative Companies in Consumer Electronics.” The company has been featured on the cover of WIRED, The New York Times, The Wall Street Journal, the Economist, Inc., Worth, The Colbert Report, Fast Company, Engadget, Make: Magazine, Rolling Stone, Time.com, IEEE Spectrum, CNN, Financial Times, NPR, Vogue Italia and many others. Follow MakerBot @MakerBot. About Destination: Design Destination: Design began in 2005 with the following regions explored: Finland, Denmark, Buenos Aires, Berlin, Japan, Seoul, Brazil, Portugal, Istanbul, Mexico and now New York (in that order). Destination: Design reflects MoMA’s mission-related commitment to educate the public about innovative items of design, and also fosters other important goals. Products sourced often help local artisans by celebrating traditional craftsmanship and interpreting this work in interesting, new presentations. Sustainability in materials and production techniques are important factors for consideration of all items included in Destination projects. Some of the MoMA Design Store’s best selling items are a result of the Destination series including the Kangaroo Desk Organizer (Buenos Aires), Pig Cooking Lid (Japan), Wooden Fishing Play Set and Tea Mug (Seoul), and Chalkboard Vase (Brazil). About MoMA’s Retail Division MoMA’s Retail Division furthers the Museum’s mission of educating the public about modern art and good design. What began in 1939 as a small sales desk in the Museum’s lobby now features three store locations in New York and one in Tokyo; e-commerce sites for U.S., Japanese, and Korean markets; a mail order catalog; and a wholesale division. The retail division works with the curatorial departments to select and develop products and publications that reflect MoMA’s programs and collections. It offers the public thousands of products, from publications and art reproductions to a varied selection of design objects, jewelry, and personal accessories, and larger design items such as furniture and lighting. In addition, any net revenues generated by the Museum Stores are used solely to advance the Museum’s mission, which includes supporting the Museum’s programs and exhibitions.